Once upon a time… I was a control freak. I know, shocker! Right? The guy who has every moment of everyday planned out in his calendar from 5am to 7pm has control issues. Betcha never saw that one coming, but it’s true… at least, to a degree. As much as I do (and the schedule is pretty packed), I can always add a little more to my plate at the last minute. It’s like moving a squadron of peas two inches to the left to make room for a scoop of mashed potatoes. The blocks of tasks to be done, and the allotted time needed to complete each, is already precisely planned out, including a couple of small blocks of Flex Time in each day; moving the peas to make room for the potatoes is a simple matter of cut and paste. There’s a control freak in all of us. I came face to face with mine several years ago when I was moderating a monthly business luncheon that involved about 80 different business owners. Each meeting was designed to make sure that somebody met someone that they hadn’t previously had the opportunity to get to know. Each meeting had a specific interactive activity planned, which was designed to raise questions and expose the overall wisdom and experience of the group. Each meeting was wrapped around a buffet lunch, that was always marvelously prepared and exquisitely presented. Each meeting came with a million and five things that could go wrong at any given precarious moment. My job was to keep the plates spinning. The night before the luncheon was always a restless one for me. I was usually up until two or three in the morning, battening down the hatches and going over every segment of the 90 minute event. As host, I felt an obligation to ensure that every attendee felt welcome. As moderator, I felt responsible to keep things moving along at a suitable pace and keep each person engaged. Whether they were a long time member or a first time visitor, I wanted this to be the best 90 minutes of their week. And, I wanted them to look forward to the next luncheon. Over a period of time, I found that no matter how much sleep I lost the night before or how well prepared I was on the day of, something was going to go sideways at some point. It’s the “Best Laid Plans” principle, or as I’ve come to more playfully address it… The Whoopsie Factor. In my latest book, I addressed this uncontrollable aspect of life in vivid detail. “The randomness of possibility puts us on shaky ground. I don’t host monthly business meetings these days, but I still do presentations to business groups and I find myself moderating other events at times. Each Wednesday evening, my wife and I host a Trivia Show, which involves an equally demanding 90 minutes of what-could-go-wrong possibility. Each show involves a good amount of preparation, but none of it keeps either of us awake the night before. We’ve learned to embrace the randomness and found enjoyment in the weekly experience. As 2017 was drawing to a close, an additional moving part was added to the festivities – Donations to a Worthy Cause. On the last three Wednesday nights leading up to Christmas, those in attendance were given the opportunity to bring a donation suitable for the highlighted charity of the evening. One featured the local animal shelter, another featured a food bank, and the last supported Toys For Tots. The people who brought donations were given tickets to be held for a special after the holidays drawing in which prizes would be given back to those who had paid it forward. On the night of our prize drawing, we had 13 prize packages to give away. Talk about adding some moving parts to an already full dance card and a tight time window. If you’ve ever drawn tickets and called out numbers for a prize giveaway, you know that even the most enthusiastic efforts, involving the most exciting prizes, can drag. I had 13 prizes to give away and a Trivia Show to host. Taking a break during the regular flow of the show and spending 15-20 minutes calling out numbers just wasn’t something that I wanted to oversee. I decided that breaking up the ticket drawing and number calling process would make it seem less of a distraction. I then added another ripple designed to speed up the process – playing cards. With each trivia question, we drew and announced a pair of numbers. With each number claimed, a playing card was awarded and randomly drawn by the lucky ticket holder. At the midway break of the game, I put a list of all 13 prizes on the presentation screen and had people to come to the prize table to claim their prize based on the order of the playing card they were holding. The order went from high to low – Ace, King, Queen, down to the deuce. It should take five minutes at most, and be done. All was going well until someone bumped my arm as I was walking between tables and the bucket holding the tickets crashed to the floor. As good fortune would have it, tickets not only cascaded to the floor, but were also swept under occupied chairs by some devious, unseen force. Disaster was striking with devastating precision. In days past, I would have been overcome with a feeling of panic and anxiety. My first thought would have been that the entire evening was about to collapse into the most horrific train wreck that any host had ever hosted. Maybe that’s how Steve Harvey felt when he crowned Miss Columbia the winner of the 2015 Miss Universe Pageant only to realize that Miss Philippines was the actual winner. Possibly Jimmy Kimmel felt this sinking emotion at the 2017 Oscars when La La Land was announced as the winner of Best Picture and then, as they were on stage celebrating, it was discovered that the actual winner was Moonlight. Truth be realized, none of those things are devastating disasters. Mishaps? Indeed. Embarrassing? On some levels, sure. But both Steve Harvey and Jimmy Kimmel have continued as hosts of those very same events. Nothing that unraveled couldn’t be re-raveled. It could all be walked back and put right. It was a whoopsie on a big stage, under a bright light, but it wasn’t catastrophic or permanent. Neither was my ticket bucket faux pas. It happened while music was playing and most of the tables were still working on coming up with their answer to the question on the big screen in the front of the room. I knelt down and began to gather tickets. Chairs moved and other people helped. 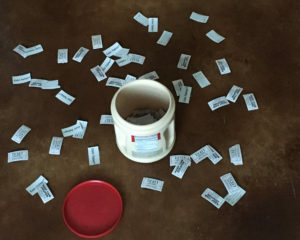 Within 30 seconds, every ticket had been returned to the bucket and I continued making my way around the room to pick up trivia answers as people held them up. Like a classic wrap up to an A-Team episode, everything worked out just fine. All prizes were given away and the event closed out on time. A fun night was had by all… including me! There was a time when I couldn’t reflect afterwards on events that I’d hosted with satisfaction and happiness. I would grind over every moment by moment turn of events and try to analyze how I could have handled things better, how the event could have been better, how I could avoid the same mistakes the next time around. It robbed me of the joy of anticipation and it stifled any hope I had of enjoying of the event as it progressed. Those days are in the past, because experience has taught me that no matter how well planned things may be, not everything will go according to plan. There’s an extra measure of excitement and anticipation in that now. Wherever I go, whatever I do, a surprise awaits and I’ve learned to Embrace The Whoopsie Factor.